Andrea and Chris came to me as a referral (the best!) and we worked together closely for well over a year bringing their wedding day together. Every meeting with them was amazing, collaborating and organizing their ideas and vision for how they saw their day taking place. 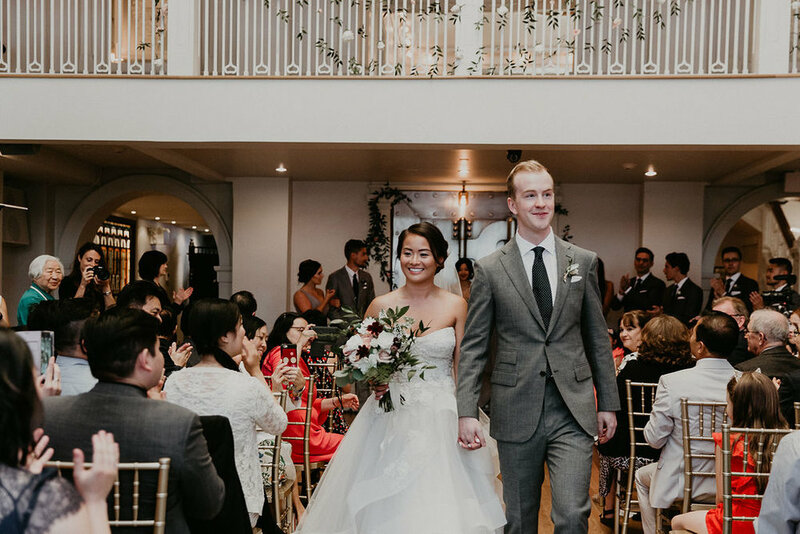 We ended up with not one, but TWO incredible venues to celebrate their amazing and jam packed day! 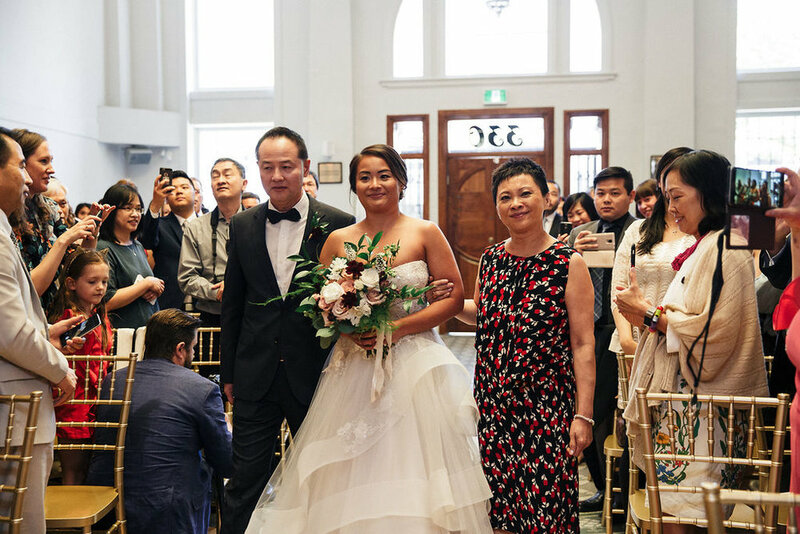 The Ceremony was held at The Permanent a renovated heritage building in downtown Vancouver that was previously the Bank of Canada. Lots of history here and a great location being in the centre of the hustle and bustle of the downtown core. 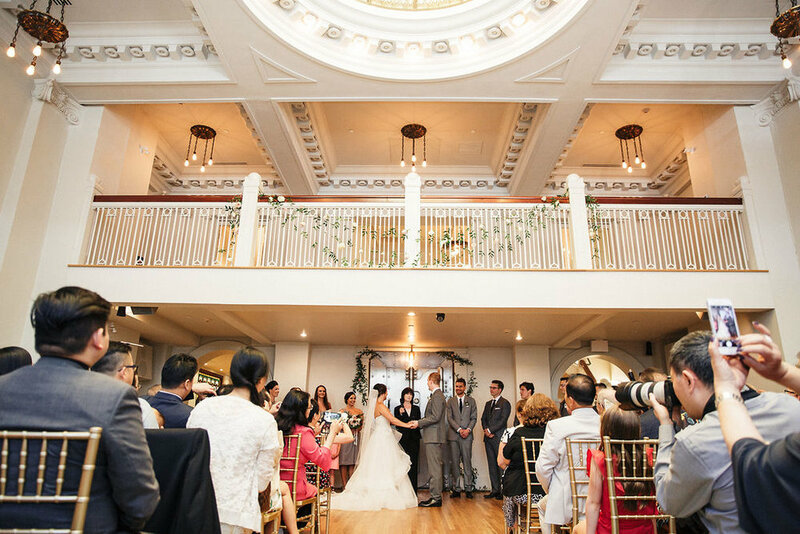 It’s an incredibly popular wedding and events venue and has also had many television shows filmed inside. The venue itself is already so beautiful with neo-classical elements, crown mouldings, bronze chandeliers and tile mosaics (just to name a few!). The showstoppers though are the stained glass atrium above casting beautiful light and the original bank vault. These two pieces are why most couples are attracted to this downtown Vancouver venue! We needed minimal decor and added a few touches to enhance what was already a beautiful backdrop. 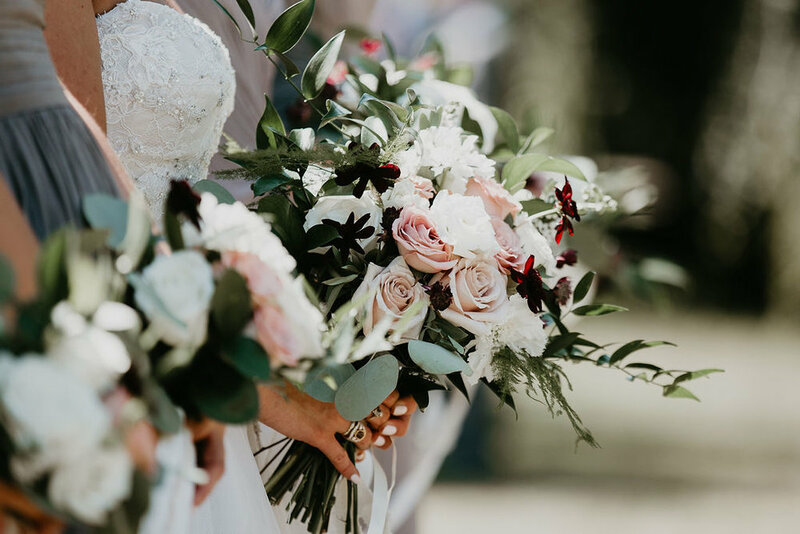 Our florist, Postmark Flowers strung up greenery garlands on the above balcony and additional greenery was added to the vault to compliment and soften up the look. The Cocktail hour and Reception were held on the grounds of the Museum of Anthropology at UBC. Talk about contrast! At the MOA, there are two beautiful traditional Haida houses built by Bill Reid. The scenery in the area is stunning, bringing in our local Westcoast culture and historic background. 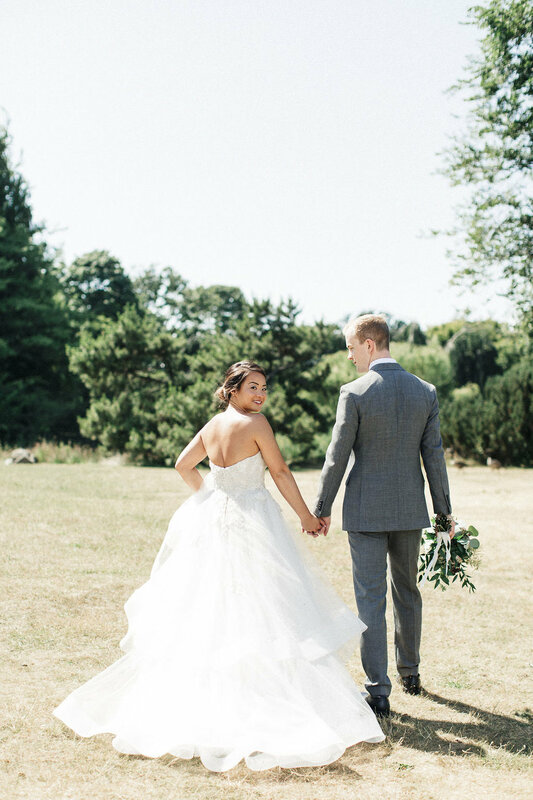 Guests enjoyed canapes and passed drinks before making the short walk over the hill and across the pond to the tented reception. What a sight! For the outdoor reception dinner, we brought in everything. From the tent itself, to tables, chairs, lighting, washroom trailers (not your average porta potty here! ), we even had to hook up to power generators to keep everything going! You name it, we brought it in and more! We kept the decor simple but with impact, using string lights zigzagging through the tent along with complimenting greenery strung up similarly. Table centrepieces were a few bud vases on each, keeping things minimal, but natural and also allowing space for the family style meals to be served. The tent was gorgeous from day to night and we thankfully had the perfect weather for it with the sun shining in and then all the candlelight and string lights providing ambiance for a fun night of dancing. For beverages, we had signature drinks of Aperol Spritz and wine passed during cocktail hour and a full bar for the reception and then on the food side guests were encouraged to interact and share with a family style menu from one of our favourite caterers, Cocktails & Canapes. I promise I’m not elaborating by saying the food was fantastic! For bringing everything in and preparing it in a small catering tent outdoors beside the big guest tent, I just want to know… HOW?! For dessert, guests got to choose between not one but TWO cakes! As someone with a full set of sweet-teeth, this is definitely appreciated! 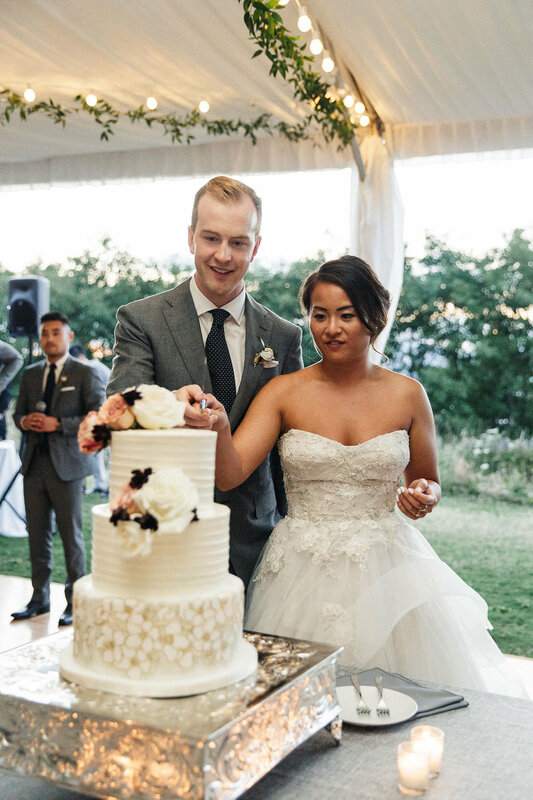 A.Elizabeth Cakes made the wedding cake, beautifully decorated with intricate flower detailing. The Groom had a special request for Chinese Mango Cake and specifically from Yan’s bakery. Can’t say no to that! All the hardwork planning was well worth it. 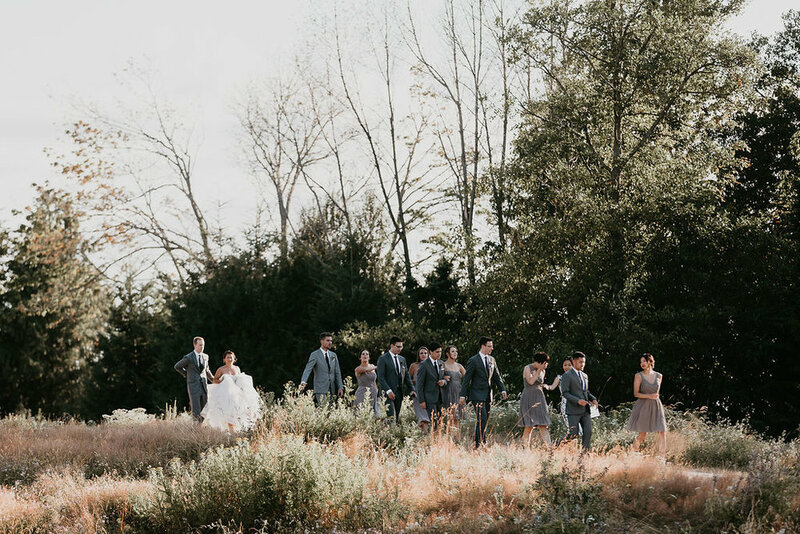 The day flew by and was extremely busy with overseeing an endless amount of moving pieces, but seeing Andrea and Chris, their family and friends thoroughly enjoying the day was the best reward. The flow of the day was beautiful with the Ceremony leading into Group Photos and then the Tea Ceremony all at the same venue. 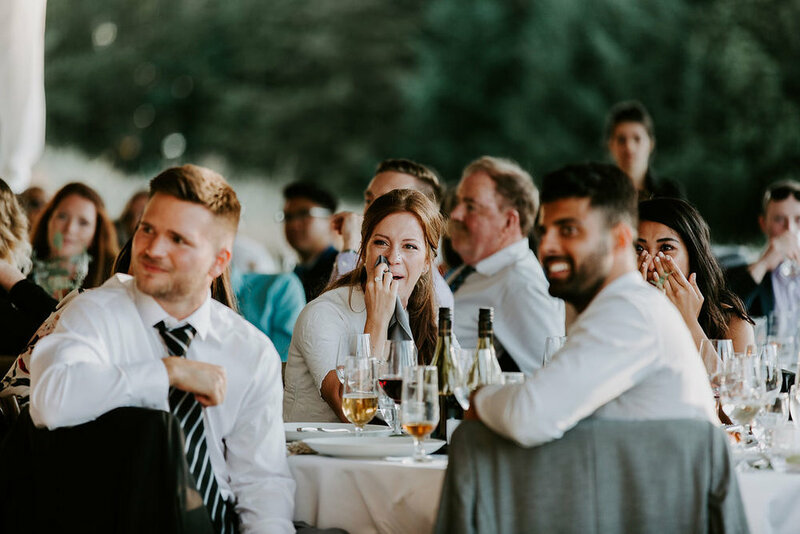 There was a break in the middle for guests to relax and the wedding party to take their photos before all reuniting at the second location at the University of British Columbia for a very different setting. The evening reception was led by Andrea’s brother and his friend as the night’s MCs and they were thoroughly entertaining with lots of jokes and personal stories. Having a great MC can really make your wedding feel warm and intimate. Even with a large guest count and they were the perfect pair, leading the events and sharing Andrea and Chris’ stories. I felt like I got to know them on a higher level too! The night’s dancing was full of their (Andrea’s) favourites, Backstreet Boys, Grease and a special line dance to Cadillac Ranch that got everyone on the dance floor! Andrea and Chris knew their crowd well. As it was basically pitch black by the end of the night, we had lanterns placed around the tent and guests were encouraged to pick one up to help guide their path back to their cars. For those that weren’t driving, a thoughtful touch was the arrangement of a big bus to transport anyone needing a ride to the Kitsilano or downtown areas! Just a testament to what a caring couple Andrea and Chris are. It’s such a strange feeling at the end of a wedding when after spending countless hours in close communication, things come to an end, but just like I have mentioned several times, Andrea and Chris are a special couple. I have had the pleasure of seeing them since their wedding several times as they have been kind enough to refer Keepsake Events to a few of their friends including Michelle and Hernán (cute note that M&H were in A&C’s wedding party and then A&C were in M&H’s!) Their wedding was held in November 2018 and a blog post will definitely be coming up in the future! 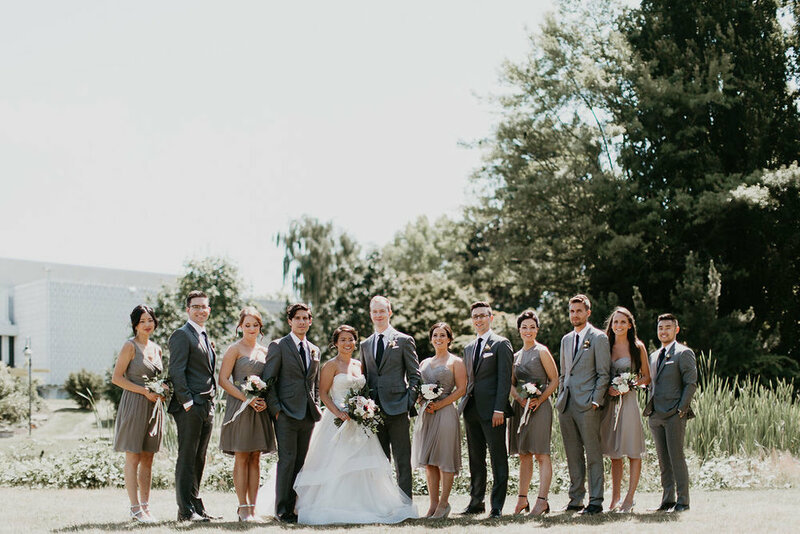 Take a look at all the beautiful pictures showcasing this Vancouver wedding and make sure to check out the long list of vendors listed at the end.